Jesus did what we could not do; he lived perfectly before God. He showed that sin isn't a necessity in our lives and that it does not have to hold us captive. 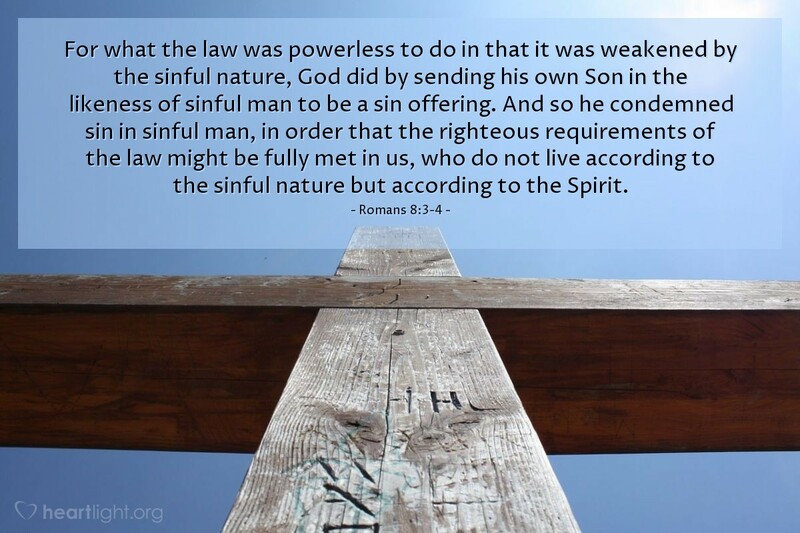 He poured out his Spirit on us so that we could not only share in his forgiveness and cleansing grace, but also so that we could have power to live in a way that pleases God. Jesus is our sin offering and our Savior. Thank you Father for providing the sacrifice for my sin. Thank you, Lord Jesus, for being willing to pay the awful price to ransom me from that sin. Thank you, Holy Spirit, for living in me and empowering me to live for God. Thank you, O God, for your salvation! In Jesus' name I pray. Amen.